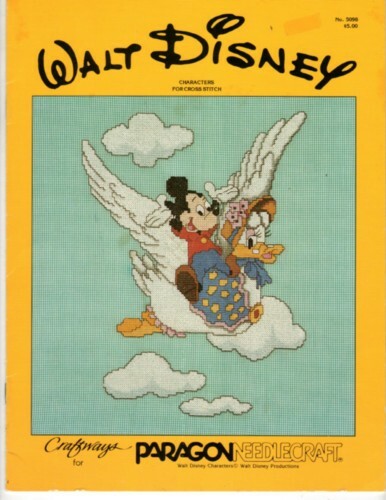 Craftways for Paragon Needlecraft Walt Disney Characters for Cross Stitch Pattern booklet. Peter Pan, Jiminy Cricker, Bambi, Flower and Thumper, Ugly Duckling, Mickey and Mother Goose, Tinkerbell, Dumbo and Mother, Mickey with Balloons, Dumbo, alphabet for personalization. Instructions for bookends, bib, Diaper Stacker, small quilt, Room sign, Baby Book cover. Sticker residue on cover. Some very minor shelf wear along edges.